Notre Dame-Hingham players take a victory lap with the Division 2 state title trophy. 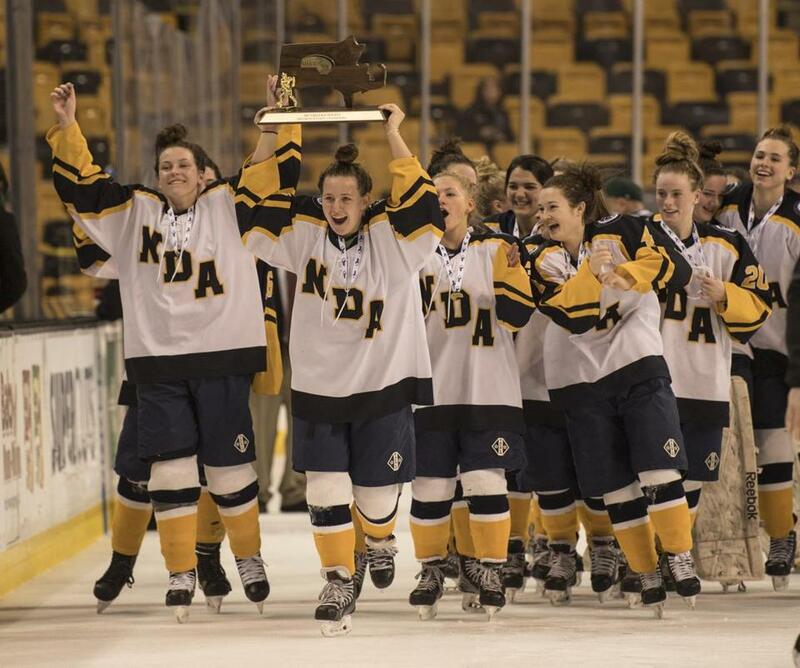 The first two periods of Sunday morning’s Division 2 girls’ hockey final at TD Garden were a defensive standoff. Defending champion Notre Dame Academy-Hingham was protecting a 1-0 lead. The third period was a different story. Specifically, Katie Pyne was the story. The 5-foot-7-inch freshman from Cohasset struck for three goals in the final period, raising her total to 11 in the tourney, to carry the Cougars to their second consecutive title with a 5-2 win over Canton. Her linemate on the first line all season, fellow freshman Skylar Irving of Kingston, netted the two other goals for NDA (22-0-1). After graduating eight seniors last year, the Cougars started the preseason with 16 underclassmen. Yet, fourth-year coach Jean-Yves Roy still set the bar high — to repeat as state champs. Roy had coached a number of the younger players previously with the Bay State Breakers junior girls’ team, including Irving, Pyne, and freshman goalie Erin Murray. The infusion of youth paid off with an unbeaten season, the only blemish a 4-4 tie against Division 1 finalist Needham on Feb. 20. “I think our returning group, our leaders did a great job leading the way with the new girls,” said Roy. That core includes junior defenders Emma Duffey, Jillian Lyons, and Meredith Stewart, who helped the youngsters adjust to NDA hockey — a strict defensive system. Irving opened the scoring in the first period, poking the puck past Canton goalie Colleen Kelleher, after Kelleher had made the initial save on a shot by Lyons. After a scoreless second, Canton scored the equalizer 1:30 into the third period, with junior Andrea McNeil scoring on Kendra Farrelly’s rebound. It was a very shortlived boost — Pyne scored less than 10 seconds later, sweeping the puck past Kelleher. She connected again two minutes later for a 3-1 lead. Sophomore Lauren Fitzpatrick scored unassisted to make it 3-2, but Pyne and Irving tallied to put the game away. It was a disappointing finish for Canton (14-5-6), making its first appearance in the final since 2006, but the Bulldogs’ tourney run produced highlight-reel finishes and stellar performances. “If you told me month and a half ago . . . I’d be playing at the Boston Garden, I would probably slap you or something because I wouldn’t believe it,” said senior Kristen Eckler. Aldrich added, “We’re very proud of the fact that the name on our shirt is who we are. First period: 1, ND, Skyler Irving (Jillian Lyons) 9:18. Third period: 2, C, Andrea McNeil (Kendra Farrelly) 13:20. 3, ND, Katie Pyne (Skyler Irving) 13:06. 4, ND, Katie Pyne 10:00. 5, C, Lauren Fitzpatrick 9:52. 6, ND, Skyler Irving (Katie Pyne) 6:47. 7, ND, Katie Pyne 2:26. Saves: ND, Erin Murray, 19; C, Colleen Kelleher, 25. Lenny Rowe can be reached at lenny.rowe@globe.com.